- I am a beginner with four water lessons under my belt. This is my first kite purchase. - I weigh 198 pounds or 90 kilos. - I will be riding a Shinn RED 141 x 44. - Wind conditions here on the southeast coast of North Carolina (U.S.A.) are typically15 to 20 MPH (but sometimes higher especially in the Fall and Spring). - Go with a two kite quiver of 14m and 11m or 10m and then decide later about adding a 8m. - Go ahead NOW and buy a three kite quiver in 14m / 11m / 9m or 8m configuration or 14m / 10m / 8m. - I am concerned that the 8m kite won't get as much use as a 9m plus the large gap between 14m and 10m. I have been told that the 2014 Switchblade has more low end range. I would appreciate your input. Thanks very much! I'm a Cabrinha dealer and know the SB's really well and you are on the right track. First and foremost, I hope you support your local dealer and instructor. They will appreciate it. Regarding the kites, you can get great range and save a few bucks by going 14m, 11m and 8m. 14m, 10m is a larger gap that can be hard to fill at times. It can be done, but the 14m, 11m and 8m is a really good quiver. Then add a 6m if you ever ride when it's nuking. If there are lighter days, maybe a 17m contra, then the 14 and 11. Stay safe and stay out of the 8m winds until you have more experience. you think so for 15-20s? I guess every beginner will vary. I personally was a pansy about power until I started launching and riding on my own. Once I felt the feeling of being slightly overpowered it was amazing and how much easier it would be to cruise. 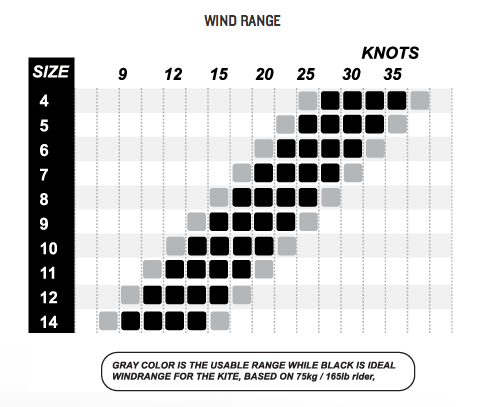 according to the chart and just increasing the kite size to match your weight it looks like a 12 would be good for 15-20 and an 8/9 would be good for higher than that. Seems like a good combo. I just demoed a 2014 Switchblade 12 and im amazed of the power! switched over from a 2013 Chaos 13 and it had more grunt..
Did not have so much time on it tough but it seemed solid, a bit more responsive and just cool! Tried adjusting the bar and it actually worked.. I don't see the point for me, but if you have only one bar its nice bonus! I am eighty kilos and I would dig a super responsive Contra as my low wind kite and rather go Contra 15, switchblade 12 and 8..
Havent tried the kites yet but I know they can make a good 15 perfect for summerbreeze foil sessions..
why not go as low end for a velocity 13 instead of a contra 15....? Smaller kite and better low end? Especially if you are heavier? Yep, I am 92 kg and 2013: 12-9 and 2012 7m did it on twice boards from 10 to 35+. The 2014 is apparently 1m more powerful than the 2013 they say. So you do't need any bigger than 12 for now and at 15+, a 9m would be the call up until close to 30 and a 12 will go up to 20 average and close to 25 in gusts. If you want a bit more margin at the top, 11-9 could be it and you add the big one next summer. I still contemplateur the 10m as being the 80% of the time kite and then a 15 and a 7m. I currently ride 15-11-7 and it works just fine. You always know what kite you should use.